Dublin, Dublin, Dublin. What a wonderful city you are. I had been looking forward to my little trip to the Emerald Isle for months, and it most certainly did not disappoint. Arriving bleary eyed and yawning early in the morning, I was delighted to be greeted by blue skies and bright sun. The weekend was off to an excellent start! The journey from the airport to the city centre was really easy, the Airlink 747 bus can be picked up right outside Terminal 1. It costs €6 for a single to the centre, or €10 for a return which is valid for three months. First stop was the hostel we were staying at. Being too early to check in we wanted some place to drop our bags before heading off to get something to fill our hungry bellies. Isaac’s Hostel was our abode of choice and luckily enough it was located just around the corner from the bus station. So far, so easy. The hostel staff were friendly and greeted us with warm smiles and open arms. They say Irish hospitality is good, and our welcome did not disappoint. Emerging from the warm hostel into the chilly November air we took a walk along Talbot Street. The hostel is conveniently located next to a pub, the Robert Reade bar and cafe, although we fancied taking a little wander and stretching out our travel-weary limbs. It wasn’t long before we came across a decent looking place called O’Shea’s Hotel. Needless to say, being the first drinking establishment of the weekend that we’d set foot in, my travel partner and I indulged ourselves in an obligatory pint of Guinness. Ahhhhhh. The food here was good and the portion sizes pretty enormous! I ordered bangers and mash and was presented with a steaming mound of creamy mashed potatoes, three fat, sizzling pork and leek sausages, all smothered in a rich onion gravy. Ireland is not a ‘cheap’ country to travel by any means, and Dublin is no exception. Over the course of the weekend we found that a decent-sized pub meal such as this would set you back anywhere between €10-€13. Not dirt cheap at all, but for food this tasty and portions this generous it certainly wouldn’t do the bank balance too much harm. As it was a gorgeous sunny, crisp afternoon we decided to take a little walk around the city and see what it had to offer. Dublin is Ireland’s capital city and is bursting with life and hustle and bustle. If, like me, you enjoy wandering around a new place and taking in all the sights and sounds on offer, Dublin is for you. 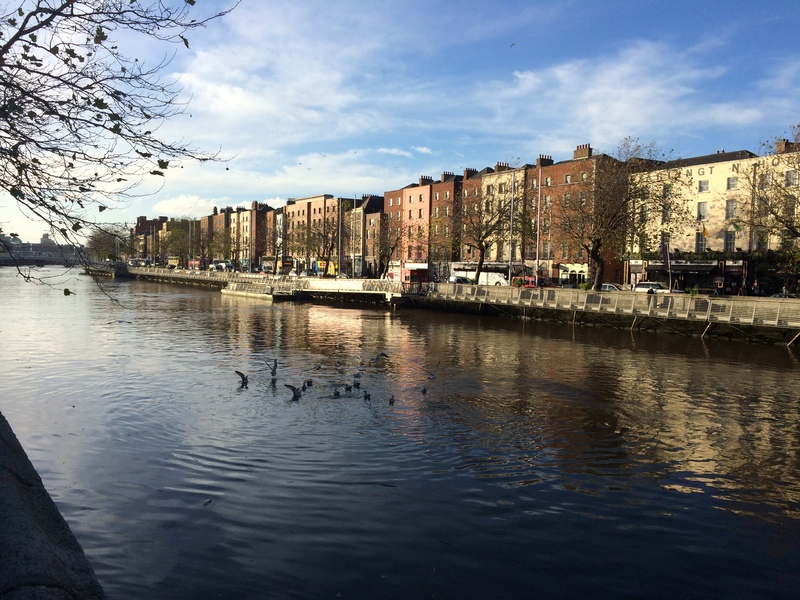 It’s a city made up of charming little back streets, cosy corners, quaint houses and of course, that vein of life that runs through the heart of the city, the River Liffey. The River Liffey and the quaint multi-coloured buildings that over look it.